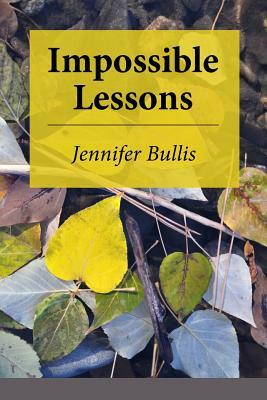 In Impossible Lessons Jennifer Bullis entwines a Stevens like wit and attention to the music of words with a contemplative eye towards both nature and family. She makes the mythic and the domestic sing. Her language is both direct and incantatory circling through the great human paradox of our animal flesh and our spiritual ascensions. These poems give pleasure to the ear and to the heart as their kind and trustworthy voices present the natural world of the northwest, and the possibilities present to an intelligent, engaged mind moving through both "blossoms and smoke." Jeremy Voigt. Jennifer Bullis grew up in Reno, Nevada, and attended college and graduate school in California. While finishing a PhD in English at UC Davis, she and her husband, seeking a green place to live, moved to western Washington. She taught writing and literature at Whatcom Community College for fourteen years before sneaking away to write, hike, and chase after their son. Her poems appear in journals and anthologies including Iron Horse Literary Review, Natural Bridge, Conversations Across Borders, The Comstock Review, Floating Bridge Review/Pontoon, Cascadia Review, Clover, and Umbrella. She served on the Board of the Whatcom Poetry Series and blogs about "Poetry at the Intersection of Mythology and Hiking" at www.jenniferbullis.wordpress.com. She lives in Bellingham with her family, which, by her current reckoning, includes a horse, two cats, andtoo many feathered, furry, and leafy creatures to count.